I'd rate this more of a 3.5 (but you know, rounding) mostly because it gets pretty slow going in the middle. Between the Lanterns is a Southern love story set in a futuristic, heartless, soulless New Dothan. As in really heartless and really soulless, where everyone is all teched out and thinking only of themselves. Yet in the midst of these near-robots, Samantha - a cook who wants people to eat Real Food instead of Nutricator slop - meets August - a tinkerer who longs for the good old days where people sat down and talked and were kind to each other - between the lanterns on West Main Street. The soullessness of the society grates on you after a while, and you're left wondering if people are really capable of being that heartless. (Maybe they are, but probably not in the quantities you meet in this book). The warm, kindly, openness of Sam and August rubs off on you too, and you start to wonder how these two got to be who they are because it hardly seems like there are any good role models for them to follow after. In the midst of all that, Between the Lanterns plays briefly with the themes of ascension and explores the concept of the soul. Is our consciousness equal to our soul? Is there a heaven? What happens if we finally manage to upload our consciousness into tech? Do we get to live forever? All in all, Between the Lanterns is worth pushing through, mostly because I liked the ending. And you wonder what is it worth? And you wonder what's giving birth? because christmas is really God saying I won't let you go. TBH Mythic Orbits wasn't exactly what I expected. (Actually, I don't really know what I expect these days.) The title and the cover made me think that it might be more space/scifi than it actually turned out to be; 'speculative fiction', of course, is a rather large umbrella term (though 'Mythic' is also another clue). The actual stories, however, are skewed to the more paranormal/fantasy side of things. There isn't any single unifying factor that ties these stories together, other than that large umbrella term 'speculative fiction' and the fact that all writers are professing Christians. This resulted in a rather mish-mash offering (this is explained in the Editor's Introduction), in which case it comes across as more of a sampler than anything else. Mark Venturini's The Bones Don't Lie is a stellar start to the book; fantasy with a slight religious bent. The Disembodied Hand (Jill Domschot) turned a little more paranormal (and slightly creepy) as was Richard New's Escapee. Though I have to say I didn't quite expect the twist at the end of the latter. Cindy Emmet Smith's A Model of Decorum was slightly predictable as a retelling of Little Red Riding Hood, but still very well-crafted. I rather enjoyed it, even though I could see the ending from miles away. Dental Troll (Lisa Godfrees) was sheer fun -- and a little younger, whilst L Jagi Lamplighter's HMS Mangled Treasure kept that light, humorous tone in a rather more serious (and disturbing) story. Another more scifi offering was Domo by Joshua M Young, with sentient robots slightly reminiscent of Asimov. Cameo (Linda Burklin) went back to something more fantasy, featuring a magical artifact with time-travelling properties and a murder mystery to solve. It had me thinking of Skyping Back in Time which has roughly the same premise. The Water Man (Sherry Rossman) as well, which I don't think I really got. Anyway, as you can see, Mythic Orbits 2016 seems to have a little bit of everything, which makes it a rather hard thing to define. Note: I received a sponsored copy of this book by the publisher for review purposes. I was originally searching for a more classic, soulful rendition of this song but THIS pretty much sums up all the emotions I was looking for. Advent is longing; for a home we long for but have never seen, for a place we travel to from birth to death. Is it this skin we inhabit, this land we lay claim to, this earth we war over? Or is home where our hearts reside, nowhere but everywhere, in spaces of love and family, friends and kin--whether by blood or spirit, flesh or soul; this nebulous feeling of safety and familiarity and rightness. And we long, because this is not our home. This is our not yet, the yet to come, the yesterdays for our tomorrows and we know--oh how well we know--that we are pilgrims passing through. There are promises yet to come. Keep safe the paths that lead us yet to home. Sebaliknya, mereka merindukan sebuah negeri yang lebih baik, iaitu negeri yang di syurga. Itulah sebabnya Allah tidak malu apabila mereka menyebut Dia sebagai Allah mereka, kerana Allah sudah menyediakan sebuah kota untuk mereka. TLDR: The Tethered World probably works better for younger audiences. I'd put it at the younger younger end of YA, maybe even MG, even if the main character is sixteen. One of those books where first person POV just doesn't work for me. Sixteen-year-old Sadie Larcen wakes up early one morning to discover that her parents are missing. When Great Aunt Jules turns up at their doorstep, she learns something even worse: they've been kidnapped by the not-so-fictional creatures her mother has been studying. Which all seems legit crazy, but she soon finds out it's not when she's sent into the Tethered World to rescue them along with her three of her younger siblings--the twins, Brady and Brock, and Sophie. FitzGerald has created a colourful world where Gnomes, Dwarves, Leprechauns, Trolls, Ogres and Nephilim live in a secret underworld that's tethered to our own--accessible by dragon, of course, because how else would you get there? Sadie and her siblings are in for a great adventure as they try to save their parents as well as their long-lost great-aunt. They fight trolls and ogres, get tricked by mischievous leprechauns, get soothed by motherly dwarfs and yelled at by soldierly ones, and learn to rely on and work with each other. The Christian content isn't overly smothering; it's presented as a fact of life. The Larcens and the denizens of the Tethered World (at least the good ones) believe in God, so they tend to pray when things get bad, or when they're in need of help. The Tethered World itself is presented as a sort of New Eden, after the first one was closed off after the Fall (hence, the Nephilim). I don't have any opinions, good or bad, about the theology behind that. Unfortunately, I didn't really connect that well with Sadie, which is probably the main cause of my ultimate meh-ness about the book, since she is the main protagonist and it is her point of view. On the surface, she seems like a very real 16YO. She tries her best to lead and guide her siblings, but she's also selfish and afraid and somewhat distracted by handsome princes. She's definitely in over her head and it shows, even if that showing comes up in her berating herself for her failures, both real and perceived. Still, The Tethered World is overall a pretty interesting read, suitable for younger audiences looking for adventure and fun. Note: I received a review copy from the publisher in exchange for an honest review. 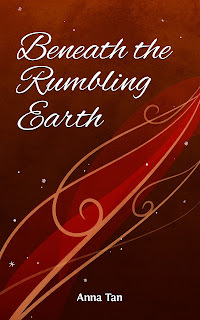 #fridayflash: Beneath the Rumbling Earth excerpt... and a Cover Reveal! Mica had always loved the Painted Hall. In the dark, cold year he spent in the castle, when everyone assumed he was the heir, the Painted Hall had been his only solace. It was the only place in the North where he could be with the sea and the creatures he loved, even if they were not real; even if they were just two-dimensional drawings on a cold wall, he was with them. In spirit. When his grandfather's spirit had been released and the Yuki-Onna disappeared, Mica feared the enchantment would wipe away all evidence of the sea from the Castle of Winter. He was glad it hadn’t. Now, with Hono’s strange words lingering in his thoughts, he entered the hall cautiously. It was as he left it eleven months ago. There was the Kraken in the deep, tentacles outstretched. The whale swum ponderously at eye-level, dark and heavy. The deserted ship still rocked in the storm. In his father’s time, there had been people—his mother’s unlucky suitors—but they’d disappeared from the walls when the curse broke. He hoped they’d been returned to their lives and to their families, but no one knew for sure. Far above, the dolphins leapt, half out of the water, as if aiming for the sun. Mica’s hand hovered over the mural. 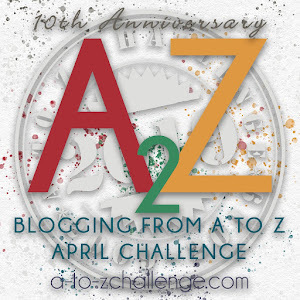 I'm figuring out a new way to publish my stories now that Pronoun is going away. 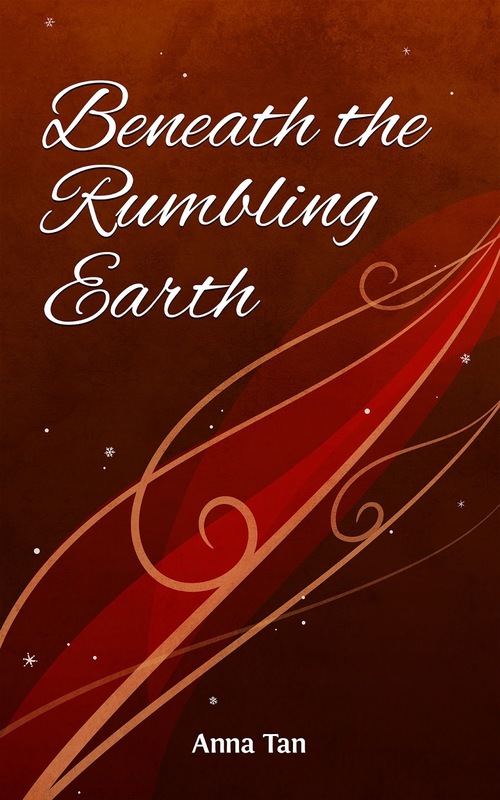 While I do that, here's the cover for Beneath the Rumbling Earth! It's the third in the North Series and will be online sometime this month! Promise! All good things come in threes and the Accidental Turn trilogy is no different. Whilst I loved The Forgotten Tale, after reading The Silenced Tale I have to admit that it did suffer slightly from the second-book slump—though only in comparison. The Untold Tale was absolutely brilliant in how Lucy pokes at the fantasy novel from within the novel, and The Forgotten Tale continues in that tradition, but The Silenced Tale takes it into a whole different plane. In this third book, the focal point moves from Forsyth Turn & Lucy Piper in Hain to concentrate on the creator of the Hain itself—the self-important, misogynistic white man, Elgar Reed. Can a work of fantasy truly stand alone from its creator? How much does the writer’s world view and experiences colour the work itself? How does the fandom that grows around a work affect it? What makes something canon? Is it the intention of the writer or how the fans interpret it? Magic isn’t supposed to exist in the real world, but somehow it’s leaking through from Hain. And Elgar is being hounded by a stalker who just might be tapping into it. Elgar hopes the stalker is a mere mortal, but if he isn’t, the only way to stop it might be to write an end to it. Only, Elgar can’t. He can’t write anything else about Hain, knowing as he does that the people in it are real. That his choices as writer have affected their lives in very real and hurtful ways. He’s learning, though. He’s learning to be better, to be respectful, to stop hurting people for the sake of the plot, to stop taking people for granted, to stop being racist and sexist in his writing—though he still lapses in real life. Fandom isn’t as pretty and gushing as it appears to be. Yes, it’s magic and it’s creative and it pushes the boundaries in a million different ways. But there are disgruntled fans out there who believe that the only way to settle differences is through violence. And that punching up to the man may sometimes need to get bloody. Frey explores thoughtfully the world of fantasy cons and fan fiction, digs into representation and intention, argues through fetishization and tropes, doubling back to stab at the patriarchy and white men again and again in various ways—We exist for ourselves and we’re worth it is the message Frey is repeating over and over again, whether you’re talking about the portrayal of women, POC or LGBT (and probably various others I glossed over) in fiction. In a way, it’s a difficult book to get through. There’s anger and hurt to work through, there’s fear and sorrow and a harrowing scene that made me want to cry, and then there’s that whole bittersweet ending; the finality of parting countered by a sense of reunion, the regret of an unchangeable past amidst a bright hope for tomorrow. In the vernacular of our times, when we’ve lost all ability to word: ALL THE FEELS. Note: A special shout out to J.M. Frey who let me read a super early copy of this book and leave comments! For some reason I thought it was Bethany Dillon and spent a long time searching fruitlessly until I decided to just google the lyrics I remembered. The seasons have turned, the year is ending. For I consider that the sufferings of this present time are not worthy to be compared with the glory that is to be revealed to us. For the anxious longing of the creation waits eagerly for the revealing of the sons of God. For the creation was subjected to futility, no willingly, but because of Him who subject it, in hope that the creation itself also will be set free from its slavery to corruption into the freedom of the glory of the children of God. For we know that the whole creation groans and suffers the pains of childbirth together until now. And not only this, but also we ourselves, having the first fruits of the Spirit, even we ourselves groan within ourselves, waiting eagerly for our adoption as sons, the redemption of our body. For in hope we have been saved, but hope that is seen is not hope; for who hopes for what he already sees? But if we hope for what we do not see, with perseverance we wait eagerly for it. But Israel is an idea, an ideal. Neither political nor of being. For who can say who won or who lost? And you who believe, you are Israel, who mourns for a world broken, an earth that groans for the coming of its King. You are Israel, who longs for the things unseen, who hopes for the redemption to come, who knows that this is not enough. This life is not enough. This body is not enough. This faith is not enough. You are Israel, who lives the struggle, and survives in the inbetween; between the death and the resurrection, in the valley of the shadow of death, looking up to the hills for the promised hope. Bukan sahaja alam semesta yang merintih, tetapi kita juga merintih dalam batin. Kita yang sudah menerima Roh Allah sebagain kurnia Allah yang pertama, pun masih menunggu masanya Allah menjadikan kita anak-anak-Nya dan membebaskan diri kita seluruhnya.